How do you start a youtube video at a certain timestamp when linking to the video from your website or Facebook (or any other social network)? This is the 2nd post of the quick series, “How to manage YouTube better”, in the first post we explained how to fast forward a youtube video and in this quick post I will show you 3 easy ways to start a youtube video from a specific time. When do you need to start a youtube vide from a specific time? Sometimes when you add a video in your website or facebook page you don’t want your readers to view the whole video but you want to draw their attention from a specific part onwards and this is where this technique is useful. Please note that by default you can only specific the start time of the video and not the end time. In other words once you start the video from a certain time it will be viewed until the end. How to start YouTube video at a certain time? 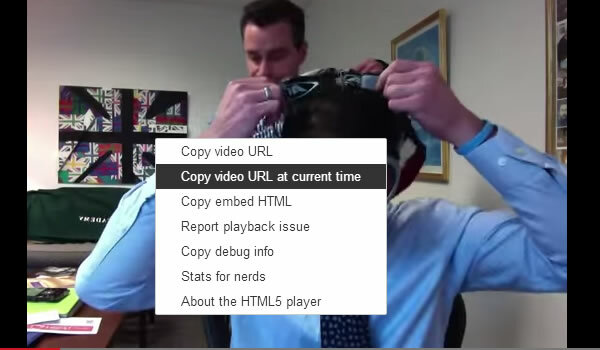 While the video is viewing, you can right click in vide area and select “Copy Video URL at current time”. This will give you a URL similar to this: http://www.youtube.com/watch?v=IukDWhf7U9I#t=15 which you can copy/paste to share or embed the video. When you do so the video will begin from the specific timestamp. Notice in the URL above the t=15 at the end which is equivalent to 15 seconds, in other words this is saying Youtube to start the video from the 15thsecond onwards. You can also use the minutes: seconds format and at #t=1m30s which is the same thing. When you click the Share button you have the option to select the Start at checkbox and this will automatically append the start time at the end of the URL. You can also change the value in the box and type in the time in minutes:seconds format i.e. 2:25 which means in 2 minutes and 25 seconds. Notice that the URL in the share box is also shorten by youtu.be for use on social networks without taking up a lot of characters. Use the above 3 methods to redirect your users or start embedded youtube videos at a certain time.